Browse the site and find original laser cut kits in four scales, one inch, half inch, quarter inch and miniature watch case scale. These kits include dollhouse accessories, dollhouse trunks, leather trunks, miniature shelving kits, wine racks, room box kits, miniature bench kits, dollhouse furniture kits and Christmas kits. The watch case kits include a Christmas scene with tree and fireplace with stockings, a Nativity Scene, an old time school room with blackboard and maps, garden potting table with clay pots and a workbench with tools and a very miniature dollhouse kit. Custom 3D paper design watch case kits are also available as well as laser cut custom watch case kits and finished pieces. The laser cut kits are very precise and fit together perfectly. These kits include an Old Fashioned Bebe Doll Trunk, Vintage Plate Shelf, Deacon Bench and Arts and Craft Style Bench. The Christmas kits include Santa and his eight tiny reindeer, a Trio of Shoppes in 1/144 scale, and a Nativity scene in two scales: half and quarter scale. All of the miniature laser cut kits include complete instructions with detailed photographs. Michelle's Miniatures laser kits make excellent club projects. Since most of the kits are offered in all scales each club member can work in the scale they prefer, but still be working on the same project. Discounts are offered for quantity orders for Club Projects. If you have an idea for a kit or need something special done for a miniature or full scale project the laser machine etches wood, glass, plexi, marble, leather and other materials. The laser machine will cut through wood, plexi, leather and paper. So the possibilities are limitless. 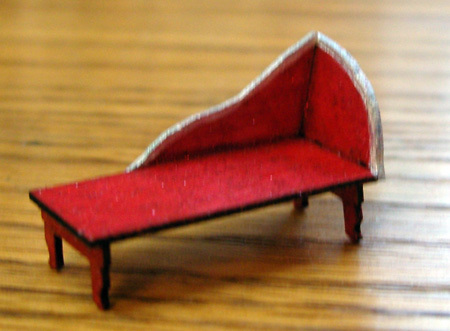 Imagine a leather engraved miniature trunk with you own custom design, that mini sign etched for your mini kitchen or some dollhouse accessory you saw in a magazine in full house scale that you would like miniaturized. Call or email your ideas and let's see what we can create.